WHITE PLAINS, NY -- An appliance store in Westchester County, New York, is getting quite a bit of attention after a hidden camera prank video recorded inside the showroom is going viral. Prisco Appliance on Tarrytown Road in White Plains was the scene for the frightening, yet hilarious prank that is serving as the trailer for the horror movie "Rings," which is due out in theaters February 3. The video was posted Monday, and has already been seen more than a million times in about 24 hours. Store owner Nick Prisco told Eyewitness News the video was shot more than a year ago, and it's all real. He said it was part of an elaborate setup that involved luring people with a Craigslist ad to give feedback on a new 4K TV in return for $50. The film crew built a fake wall and installed a control room behind it. The crowd lined up, and then the screaming ensued. 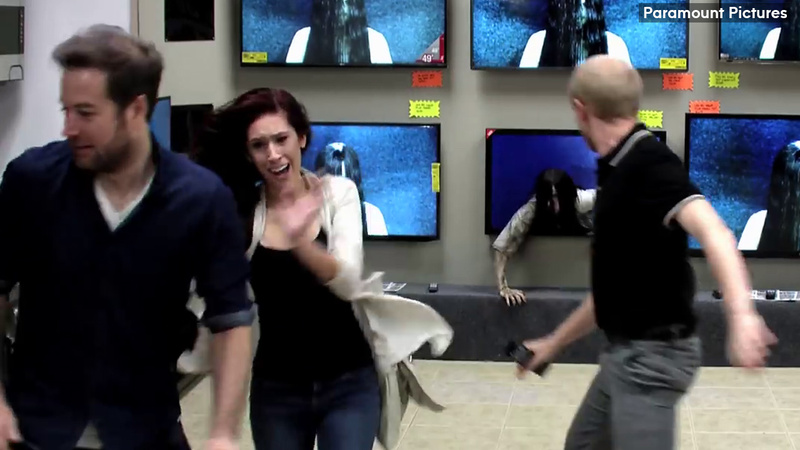 The prank involved a character from the movie popping out of one of the TV screens and touching or approaching people looking at the TVs. "It was very funny," Prisco said. But with any prank comes some risk of some people taking it too seriously. "One guy freaked out," Prisco said. "He thought it was real. He pulled a knife."